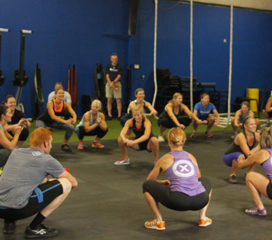 CrossFit X was established May 4, 2009, by Travis and Alycia HoGlin. 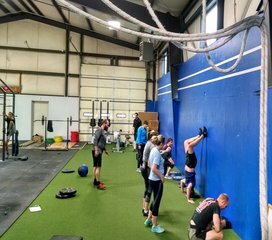 Our goal when we set out to was forge a place where people, regardless of experience, background or current circumstances, can come together to enhance their lives through strength, conditioning and community. Our gym a place to positively impact and empower people to strive for and achieve the goals most important to them. To create an environment of higher learning for movement and fitness centered around excellence in form, technique and mechanics. A home away from home where everyone is welcomed, encouraged and always supported. Older, younger, active and not-so-active, everyone has unique movement imbalances and limitations that can lead to pain and injury. The Functional Movement Screen reveals your weaknesses, so you can begin strengthening them; working out in a gentle but highly targeted and effective way. Based on your screening, Shasonta, our FMS expert, will develop a customized plan of corrective exercises that meet your needs, continually tracking and updating your plan as you progress. So grab a fellow runner, golfer or athlete of any age and contact your local FMS expert. Get moving right now!